"Ebony and Blue" A symphony in color, arranged and interpreted by Georgie Stoll, musical director, Chinese Theatre Symphony Orchestra. Though comprised of many modern melodies, you will note throughout the musical fabric the aboriginal rhythms . . . the weird strains of the jungle . . . the measured beat of the tom toms . . . which are the background of today's popular spirituals and symphonic jazz compositions. Hearts Metrotone News . . . Fox Movietone News These two great news subjects bring a kaleidoscope of interesting, timely happenings all over the civilized world . . . in scenes . . . in sound . . . in dialogue. "Rhapsodie in Black" Presented by Fanchon & Marco. Staged by LeRoy Prinz. Featuring the Norman Thomas Quintette with Etude Ethiopian Chorus of 30 voices, directed by Freita Shaw . . Laura Smith . . George Green . . James Johnson . . and 30 African dancing beauties. A Classic of stagecraft . . a highly impressionistic portrait of primitive African peoples, rhythms and melodies depicting the birth of rhythm. 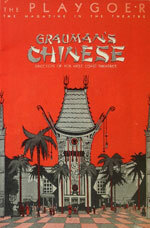 Film House Reviews - Grauman's Chinese - Hollywood, Jan. 23. 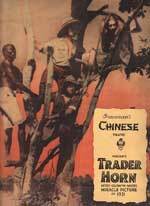 The Chinese in a revival of its past atmospheric prologs is spreading itself colorfully for the 'Trader Horn' world's premiere, with 'Rhapsodie in Black' as the Fanchon & Marco presentation staged by LeRoy Prinz. While atmospherically intended to be African in motif, in keeping with the Congo locale of the film, it's more a throwback from Harlem and the black-and-tans. Regardless, salable stage stuff. Everything is colorfully blended, breaking up the black man's jungle chants with a hot line of 20 dig-diga-does doing that thing with rumba variations. The Norman Thomas sextet is the kingpin of the presentation, which is embellished by the Etude Ethiorian chorus of 30 voices; Edith Spencer, soubret (sic); Laura Smith; George-Green, James Johnson and Freddie Crump, the eccentric drumming specialist with the Thomas sextet. Indeed to suggest the African evolution of rhythm and melodies, it's oke popular entertainment despite the high-sounding purpose of it all. That torrid coaching line of hi-yallers, all nicely featured chorines; the vocal flash of the Etude Ethiopian chorus, plus the eccentric comedy of the Thomas sextet, makes it a commercially sound stage flash. Freddie Crump is one of those belly-sliding, cymbal-clashing traps experts who works a la Jack Powell. The Thomas sextet, of which he is the featured member, otherwise comprises Thomas at the irovies; a nifty 'snake-hips' hoofing team and a trumpet soloist. Miss Spencer, well known around the Harlem nite clubs and doubling from the Apex, a local black-and-tan, does her vocal stuff satisfactorily. Laura Smith and Jimmy Johnson click with an eccentric s. and d. opportunity, and George Green doing buck and wings on rollerskates is another acceptable stop-gap. The prime idea of rhythmic flash and color is well gotten across with LeRoy Prinz's staging counting effectively along those lines. Overture was equally in keeping with the 'Trader Horn' motif. Georgie Stoll, directing a corking 'Ebony and Blue' symphony of his own arrangement, got in all the atmospheric weirdness of the jungle and tribal fetich (sic). Usual newsreels wound up the preliminaries to the rather long feature, which the atmospheric African forepart tended to make seem even longer. The Chinese should do some trade with this show. 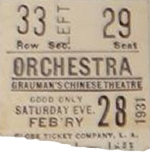 An issue of The Playgoer, dated Monday, January 22, 1931 (1st Week), exisits for this engagement. A fabric of melodies of Old Cathay inspired by the atmosphere and architecture of the Chinese Theatre. Liberating the music and rhythmic poetry of line and color which is the soul of the design of the Chinese Theatre, Georgie Stoll, conductor, has arranged a blending of compositions of the Far East. An ultra-modern extravaganza centering around three scenic figures. . ."The Orchid Lady," "The Peanut Vendor" and "The Old Fashioned Lady." Fanchon & Marco strike an ultra-modern note in novelty, the action being staged around three mammoth scenic figures, representative of various types in dramatic interpretation. These figures were prepared in the scenic department of the Roxy Theatre in New York City especially for this prologue. 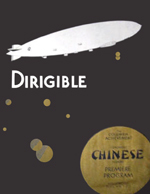 Film House Reviews - Grauman's Chinese - Hollywood, April 7. Columbia went 25 grand on the nut for the western premiere of 'Dirigible' and put it over in style. Lights, dirigibles, radio-telephony, ballyhoo from airplanes, special ether announcer (John P. Medbury), were part of the trimmings. But probably most noteworthy, and not paid for, was the unofficial but wholehearted good-will manifested by the first-nighters towards Harry Cohn's latest important production. The stage show preliminaries preceeding were refreshingly apart from any 'atmospheric prolog' idea to the film theme. It worked out very well by reason of contrast. If nothing else, it eliminated the steeping of both stage and screen atmospherics along the same general lines. 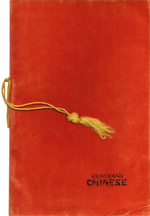 'Inspirations Chinoises' overture took it motif from the Chinese aura of the theatre. Georgie Stoll conducted his brilliantly colorful blending of Oriiental themes, working in the 'Limehouse Blues' and 'Chinese Lullaby' with the rest of the orchestral hors d'ouvres and producing a nifty overture. There was novelty muted violin instrumental bit, through a large megaphone, that futher punctuated the presentation. Prolog was titled 'Trois Grande Figures' ('Three Big Figures'), employing the novelty stage pieces which the program credits to the Roxy, New York, scenic department for origination. The first part of the trio, a mammoth 'Peanut Vendor,' reclining in the indolant fashion with the 40 girls emerging from his basket, won the enthusiastic salvo which it merited. It gave the galls some limming opportunities and again worked in skillful orchestrating of the 'Vendor' number, the 'Bolero,' 'Marchela,' etc. Tom and Hank, Rita Owin and the five Jansleys, latter unbilled, were specialty highlights. Norce, contortive specialist, Helene Hughes, prima, and Harold Stanton, local tenor, completed. Tom and Hank and the Jansleys arrived on the afternoon of the premiere from New York. The former look quite juvenile and do lariat stuff in engaging style; also top pff with some cross-stage rodeo stuff on spotted ponies. The Jansley's with their lightning risley and pedal artistry built up the speed element by a highly tensioned nervousness which is great showmanship. The other two 'grandes figures' were the 'Orchid Lady' and 'Old Fashioned Lady,' dovetailing into Miss Owin's eccentric hokum, including a sitting-down chair-dance. Miss Fanchon personally staged the pprolog which runs 35 minutes and could be chopped to some advantage. One sluggish interlude in the old-fashioned number will take up the slack nicely. Performances at regular price schedule Twice Daily, 2:30 and 8:30 P.M., starting Wednesday, April 8. Seats at Box Office, GL 5184 or Owl Drug, 6th & Broadway, and all agencies. An issue of The Playgoer, dated Friday, May 29, 1931 (1st Week), exisits for this engagement. 3. Grantland Rice Sportlight "Battling Silver Kings"
An issue of The Playgoer, dated Tuesday, August 25, 1931(1st Week), exisits for this engagement. An issue of The Playgoer, dated Thursday, September 17, 1931 (1st Week), exisits for this engagement. An issue of The Playgoer, dated Monday, October 19, 1931 (2nd Week), exisits for this engagement. Film House Reviews - Chinese L. A. - Hollywood, Nov. 13. In the endless shuffling of theatre policies locally, Grauman's Chinese has again popped up as a $1.50 two-a-day stand for run pictures with stage shows. Resumption of this policy after a stretch of day-and-dateing straight pictures with the downtown Criterion is of much gratification to Hollywood boulevard merchants, who have said that when the glamor of Grauman's Chinese departs, so goes the glamor of the boulevard. These merchants led a vigorous campaign for return of the $1.50 shows. Hollywood boulevard was again its former self with the $5 opening night of 'The Champ.' There was the battery of roving arc-lights, the dense knot of peasant fighting for glimpses of ermined picture royaly, and a squad of marines in the forecourt to greet the guest of honor, Vice-President Charles Curtis, in Louis B.Mayer's party. It was all so typically Hollywood as to bring lumps to the throats of those who have been classy rents just to have Hollywood boulevard as their store address. Inside, 'The Champ' (Metro) demonstrated its ability to give the $1.50 policy a rousing send-off, but it is getting little assistance from the stage show, 'Once Upon a Time,' which is a reconditioned Fanchon & Marco unit produced by Gae Foster and first seen by audiences at the Poll, New Haven. Only portion of the unit bearing any resemblance to the price and intended atmosphere of the house is a spectacle employing a huge smoke-breathing dinosaur which was brought from the Roxy and brings $630 royalties to the manufacturers. Talent section includes Keith Wilbur with an outmoded vocal imitations routine; Franklyn Record, tenor, who failed to make a harmonious hookup with the orchestra at the first performance; Dorothyea and Helene Blossom, roustabout sister team who have no voices but sing, and Raye, Ellis and LaRue, two-man and girl adagio act who have added much grace to the routine by working in waltz time. Opening number had the tenor singing against a projected full-stage motion picture of a rocky seacoast while the ballet eased through a veil dance. The girls were also in on the dinosaur finish, screaming and hotfotting around while the mechanical dinosaur lifted the female member of the adagio trio and with it flexible neck neck projected her over the audience and back. Without that the show would have been a dud, and even with it the unit as a whole is weak stuff. The Blossom sister team reciting introductions to numbers in strained voices and then tearing into the childish hoke were a strange sight in the formal quality of the opening night display. Likewise Wilbur's beast-fowl-and-banjo imitations. Dion Romandi's pit orchestra carried the stage show accompaniment assignment capably. Pete Smith's 'Athletic Daze' (Metro) and Fox and Hearst newsreel clips completed. Feature has demonstrated a fine draw and will compensate for the below-par stage performance. Fanchon & Marco should have no trouble bettering the stage end, which must be of higher quality after 'The Champ' moves out. Egyptian, also on Hollywood boulevard, is now day-and-dating on a grind with the Criterion. "Tonight is Shriner's Night - visiting Nobles and Members of Al Malaikah Temple will attend - WEAR YOUR FEZ!" Evening Premiere at 8:15; Tickets: $3.00 "Formal Dress Suggested"
Film House Reviews - Grauman's Chinese (Sid Grauman) - Hollywood, Dec. 25. 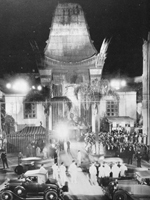 Sid Grauman's return to the Hollywood deluxe cinema bearing his name was the occasion of considerable to-do and ballyhoo for the Chinese duplex premieres Christmas day and night. Jackie Cooper officiated at the $1-$1.50 Xmas matinee and Wallace Berry and Clark Gable were in person at the $3 (no longer $5) supplementary premiere tonight. Beery-Gable figure as the stars of 'Hell Divers' (M-G), the feature. Metro is spreading itself even unto the unusual of advertising that "formal dress suggested" for the $3 nite premiere, with the representative turnout of picture people generous, especially considering the holiday and unusually strong legit premiere opposition from two shows that same night. 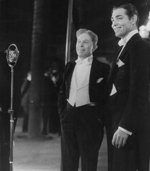 Grauman utilized Fanchon and Marco talent and ingredients, supplimented by his own personal selections, for his eleaborate prolog for which Oscar Baum's baton officiates in conducting the orchestra. Baum was at the downtown Paramount during the Publix regime. Grauman personally figured in Fox-West Coast and Fanchon & Marco continuing the booking of Metro pictures after that studio stalled on further product and squawked that even with 'The Champ' (just closed here) the studio can't make any money on it films in view of the Chinese's grosses. F-WC, through Oscar S. Oldknow and Harry Arthur, with Mike Marco on the stage end, then proposed to secure Sid Grauman to supervise the eleaborate prologs which were effective at the box-office in the past, with M-G-M agreeing and deciding to try it for three pictures. It's generally agreed that M-G, however, is taking advantage of a psychological situation to slip in 'Hell Divers' at $1.50 with the Grauman ballyhoo and rep relied on to carry it for a spell. Show itself while longish at the opening matinee packs lots of color and talent and once its 70 minutes is chopped it will be 100% as it's swell stuff and looks all of the $5,000. Nut, not mentioning the costly costume and scenic investiture. Costumes are especially lavish. Lots of talent and considering most of it arrived the day of opening, or day preceding, it played nicely. Perry Askam's tenoring, with a male chorus of 20, wowed, particularly his 'Desert Song' hits which he popularized on the Coast. The 32 girls are all lookers, and work like the proverbial Trojan, scoring touchdowns often. Raymond and Virginias, acrobatic dancing specialty, was a novelty and Helen Hughes and Elmer Herlings, adagio preceding the finale, were also effective. Robins, the 'Walking Music Store,' was surefire here and the Kikuta Japs climaxed although the prolog holds several anticlimaxes. Hilton Sisters, Siamese Twins, are another ballyhoo highlight from the Metro lot, where they were assigned to 'Freaks.' Grauman has many other ballyhoo movelties and is putting it on in a big way. Baum's maestroing merits commendation with the Kreisler medley overture. Patently the Grauman big show idea is back solidly, and, once properly pruned and retouched, this show is a cinch. Mr. Grauman and Mr. Gable at the evening Hell Divers premiere. 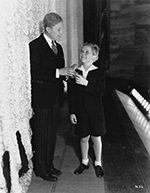 Mr. Grauman presents Mr. Cooper with a Christmas present of a wristwatch at the matinee Hell Divers premiere.